Meanwhile, Hazel and the crew of the Argo II have a choice: to stop a war or save their friends. Whichever road they take one thing is certain - in the Underworld, evil is inescapable. The fourth book in the bestselling Heroes of Olympus series - set in the explosive world of Percy Jackson. The Greek and Roman demigods must work together to seal the Doors of Death - and help Percy and Annabeth escape the Underworld in the process. 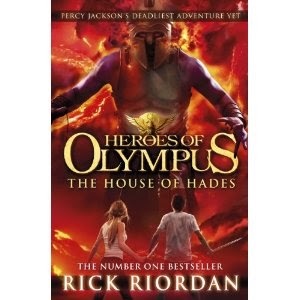 The fourth book in the bestselling Heroes of Olympus series - set in the explosive world of Percy Jackson. The Mark of Athena was a No. 2 bestseller and has sold over 64,000 copies (TCM) in Hardback and counting! Rick Riordan is an award-winning mystery writer. He lives in San Antonio, Texas, with his wife and two sons. Percy Jackson and the Lightning Thief, Rick's first novel featuring the heroic young demigod, was the overall winner of the Red House Children's Book Award in 2006 and is now a blockbuster film franchise, starring Logan Lerman.